There are many children’s books about butterflies and their adventures, as well as their transient existence, but few, if any, can compare with this book in terms of biological accuracy. 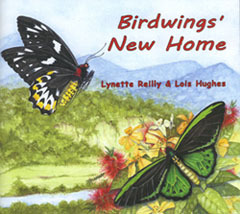 Lyn’s text and Lois’ magnificent illustrations combine seamlessly to portray the story of the adult lives of two Richmond birdwing butterflies. The plants adorning the pages are botanically very accurately depicted which is an important learning experience for the target readers. The three butterflies in the story are exquisitely true to their real life counterparts. This is not surprising as both Lyn and Lois are very experienced in the art of interpreting the living world to readers by means of story telling and artwork. The story, which is suited to lower primary students, begins in the birdwings’ little piece of Utopia – a beautiful rainforest. The peace and quiet of this idyllic life are shattered by an all too familiar event – the clearing of the forest by humans. The rest of the story relates to the butterflies’ search for a new home and the friends and enemies they meet along the way. Fortunately, they find a restored rainforest in a park, in which they can at last find a secure home. This book illustrates the importance of recognising important ‘flagship’ species and protecting their habitat for them and other species. Children reading this impressive book will also come to realise the importance of creating habitat – the art and science of bushland restoration, so important in today’s fragmented world, where we are losing bushland slowly but surely in a ‘death by a thousand cuts’. Let’s all hope that this simple little book will influence profoundly the perception of the natural world in children and their parents alike. Congratulations to the author and illustrator on creating a unique piece of Australian literature. Helene Cattermole, Lamington Natural History Assoc. Inc, Beechmont, Q. This well-illustrated and colourful book tells the story of two Richmond Birdwing butterflies displaced by urban expansion. The foods they eat, their flight patterns and their poisonous enemy vine are clearly and artistically displayed in the pages. The story ends happily and the message – to plant their food supplies to enable them to continue their existence – is clear. I believe children will love and learn from this gentle attractive book. Lyn Reilly, together with Lois Hughes, has come up with yet another delightful book for children (and not only children, as it has given much pleasure to this adult reader). The book is a delight to the eyes, with Lois Hughes’ wonderful full-page, full colour illustrations. The story is simple but so appealing. And I have been particularly intrigued with the actual style of the printing of the text – very innovative. You need to see it to understand what I mean. The story is about the loss of habitat of a couple of Richmond Birdwing butterflies and their adventures as they search for a new home. The depiction of the lifestyle of the butterflies is quite accurate and the illustrations are just begging to be framed. The author finishes with a note on the status of Richmond Birdwing Butterflies and the efforts to conserve them. If you have children or grandchildren or nieces or nephews, make sure you give them a copy of this book with its gentle conservation message.